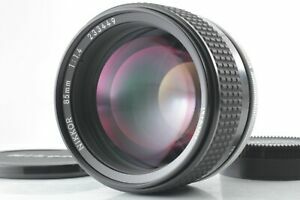 NIKON NIKKOR 85 MM 1.4 AIS NEAR MINT CONDITION - SELLING WITH NO RESERVE! moa-design has no other items for sale. The Nikon Nikkor 85 mm F/1.4 Ai- S lens wears its big size and ability to turn backgrounds into soft colors with pride. The professional lens exclusively fits FX and 35 mm cameras to yield bright, sharp, and high-resolution stills. The hard infinity focus stop renders the lens perfect for astronomy, with its ability to attain a fixed laboratory-perfect focus all night. The ultra-fast f/1.4 aperture in this wide-angle Nikkor lens creates attractive bokeh with its rounded 9-blade diaphragm and offers great low-light performance yielding high contrast at any aperture or focus distance. The anodized aluminum hood protects the lenses from unprecedented damage. Nikon doesn't make them like this any more... Built like a tank, focusing is buttery smooth, and the pictures are usably sharp even wide open. Stop down a bit for super sharpness. Bokeh is excellent. Good: built like a tank, sharp from f2 on, great light gathering, smooth focus Bad: heavy. 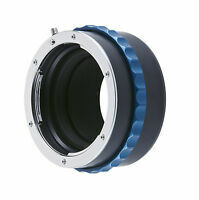 Value: expensive for a 85mm, but reasonable for a high quality fast 85mm. I would buy again and recommend. If you dont mind using a manual focus lens. This lens compares favorably with its modern Zeiss cousin. I was a little nervous spending so much on an old, used lens that I couldn't inspect before hand but WOW am I ever surprised. It's hard to say if it's as tack sharp as a Sigma 85mm 1.4, but the quality of image is something the sterile, digital era lenses can't touch. Believe what you read on this lens, worth the buy! This lens is in very good condition. I could not see any defect on the lens. The mechanical parts are also durable. I tested the image quality and very satisfied.